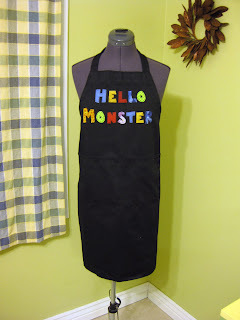 Liam and I made this apron for Daddy so that he no longer has to wear my pretty floral ones. "Hello Monster" is Liam's favorite game to play with Daddy. Daddy invented this running and chasing game a month ago and has had to play it every day since. 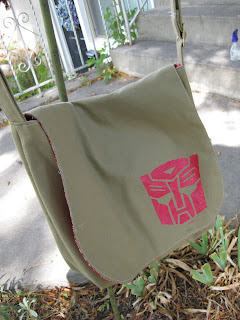 To create it I used this tutorial from Chronicles of a Mommy but machine sewed the edges this time with a contrasting black thread. It's another great project for all those scraps. 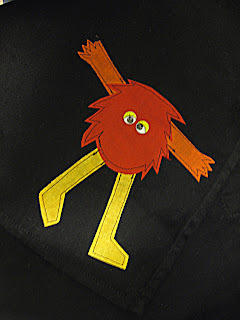 I cut out a bunch of monster pieces from my personal scrap stash and ironed fusible web to the backs and let Liam create his own monster. 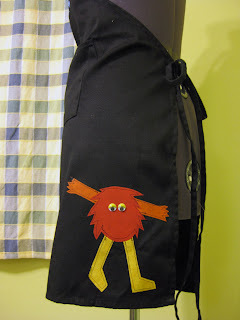 This is what he came up with, and I ironed it onto the corner of the apron and glued on a set of googly eyes. how cute. I love that you let Liam build the monster. How precious! That's awesome - we're a band called Hello Monster, and we were wondering if we could link to this posting from our blog/Facebook/Twitter etc?